You can’t go wrong with gifting a sweet treat so Kathy is going to show you how to use the brand new Perfectly Pink papers to create a holder for all sorts of yummy goodness! 1. You will need a circle approximately 22cm in diameter. A side plate is an ideal template. Draw around the plate on the back of your chosen Perfectly Pink 12x12 paper design and cut out the circle. 2. Score vertically at 4cm and 6 cm from either side of the circle. Measure 12 cm and 14 cm from the top point of the circle and score horizontally at these points. 3. Cut along the widest score lines as far as the 12cm vertical score line on both sides. 4. Cut away the squares created where the four score lines intersect on either side. 5. Fold along the score lines bringing the sides in first then folding up the bottom to create the gift box shape. Use your preferred adhesive to fix the box together. 6. Fix a decorative Dovecraft doily to the inside of the box. 7. Trim a 12 x 12 paper in a contrasting pattern to 14cm by 26cm. Score vertically at 4cm, 7cm, 17 cm and 19cm. Wrap around the box to check the fit, then fix at the back using your preferred adhesive. Trim a piece of ribbon measuring 26 cm and fix to the sleeve. 8. Finish by wrapping a length of Dovecraft Ribbom around the sleeve you added and adhering at the back. Layer two Simply Creative paper blossoms with small foam squares and top with a Simply Creative gem. Adhere to the right hand side of your holder. 9. Fill the box with a cellophane treat bag filled with sweet goodies and tie with a length of Dovecraft ribbon. 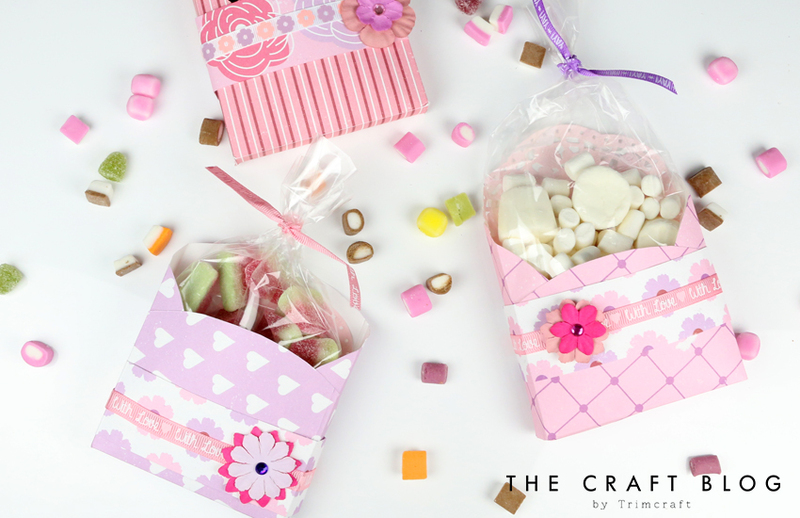 This pretty holders would make great party favours or a sweet gift for a friend! How will you use Kathy’s yummy idea? We would love to see so don’t forget to #trimcraft and @kathycraftstv when uploading to social media and to share your makes in the Inspiration Area!